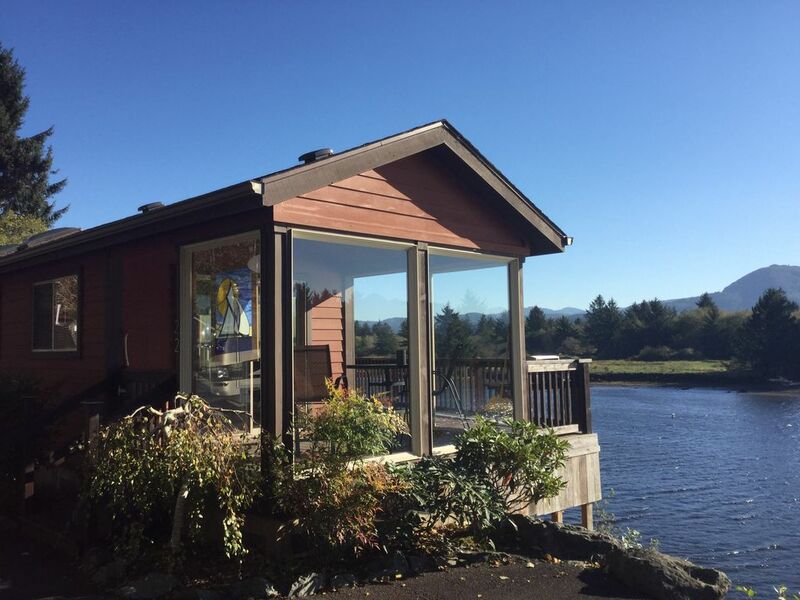 This beautiful little cottage perched on the edge of the Nehalem River just minutes from the ocean. When it's stormy at the coast this location is protected. The expansive deck and windows provide an excellent view of the river and a variety of wildlife including elk, bald eagles, heron, sea lions and of course fishermen. The unit is located in a quiet clean RV park (Nehalem Shores), the pace is slow and the locals are friendly. Enjoy fantastic fishing or kayaking on the river, shopping nearby antique shops, wine tasting or kite flying...beachcombing...horse back riding...surfing...Manzanita Beach. You'll love the comfortable cozy feel of this cottage rain or shine. Laundry services and free wi-fi are available. The cottage is just a short drive from Portland but well away from the busy tourist hubbub. A fantastic weekend or vacation getaway spot, ideal for a couple or a small group of friends. We are a retired couple based in Portland who love to travel in our motor home, especially to sunny southern California in the cooler Oregon winters. We love having a place to land to enjoy time with our kids, grandkids and great grandkids at the Oregon Coast. Our kids of all ages find plenty to do and it's great fun for the whole family. Portland is getting bigger and bigger and busier and busier. We love how relaxed things are at the coast. Everyone we've met here is very friendly and has a funny story to tell. It's an ideal place to get rejuvenated. We love watching the eagles who nest in a tree across the river from our cottage and of course the herd of elk we often see grazing in the morning and evening. It's also fun to keep an eye out for river otters or sea lions and of course watching the fishermen reel in some big fish is entertaining. Nice view of the coast range across the river. The cottage is perched right on the edge of the river. Quiety and beautiful. Linens provided for up to 4 guests. Available just across the drive in the clean community laundry room. Towels for up to 4 guests. Everything you need if you are inclined for cooking. Nice big window at the dining table. The deck/balcony extends the length of the cottage just above the river. Rentals available in Nehalem just down the river and road. Outdoor table and six chairs are right out the front sliding window under cover. Manzanita Golf Course is about 10 minutes away. I very much enjoy this small cottage on the river it was well equipped with all I needed for my stay. Bed very comfortable, kitchen was set up well. I was able to bring my small dog Snow on my stay which was very important to me. deck with eating area overlooking the river with an outside grill area. much appreciated. I highly recommend this great cottage. Upon arrival our first thoughts, quaint, adequately supplied, clean, a fair price! We really like the layout, kitchen is adequately supplied, an abundance of towels (which most places don’t have), nicely located on the river, and our first impression upon arrival...very tidy and clean! Plenty of space/drawers for clothes, each night stand had a lamp, and roomy closet. Once we carried our belongings inside, we attempted to turn on the heat, no heat. We contacted the onsite care taker, he also was unable to get it functioning. A call was made to the owner, he supplied us with his personal space heaters, those were sufficient in heating the cabin. They assured us they would move us to another cabin if we weren’t happy with the space heaters. A couple things I would suggest, better quality sheets(the ones supplied were kind of rough), a little more attention given to the cleanliness around the bathroom/vanity outer edge of the floor, and the are rugs could use a washing. We would definitely stay again! It was a perfect little hunting cabin! We will most likely reserve a cabin next year for this very same time. Loved the deck and quietness of the setting! Thank you for the opportunity to stay in this quaint community! Clean and Cozy Cottage on the River! My husband and I were thoroughly happy with this sweet cottage. The peaceful tranquility and beautiful scenery we experienced is hard to put into words. The RV park is a gem. You will enjoy the views from the kitchen table as well as the covered porch and deck. This cozy home has everything you need. You can take little side trips to Cannon Beach, Tillamook or Seaside. There is plenty to do. Loved it all! Thank you PJ, Gary and Lucy for your kindness. On our way back home to AZ, we both kept saying I wish we could have stayed for another week. It was the best part of our Road Trip. Blessings! Hope to be back one day! We had a great time! Loved the small town of Nehalem. The house is in a great spot! Our family group of four stayed comfortably here. There's plenty of seating and the pull out couch is firm. We all ate and played games around the table. The RV park shower house is only a few steps away. We found that very useful as the cabin's bathroom is compact. The deck is great for watching the doings on the river--herons hunting their breakfast were especially interesting. We had an easy drive to a special event in Cannon Beach. This is a very clean getaway house in a quiet neighborhood. Excellent fishing on the Nehalem River and crabbing at the mouth of the river (if you can beat the sea lions!). Just 2 hours from Portland. The Wheeler, Nehalem and Manzanita area is beautiful without the super busy touristy feel like Seaside. Rates are flexible depending on length of time you stay. Please submit an inquiry via this website and we'll send you a rental agreement for payment purposes. Monthly rentals will have an additional fee for electricity and propane use.